Thank you for the cool photo inspiration, Cali! The terrace of this restaurant (which has been there since 1780, btw!) has one of the best views in Paris. It faces the river, right across from Ile de la Cité and Ile St. Louis. 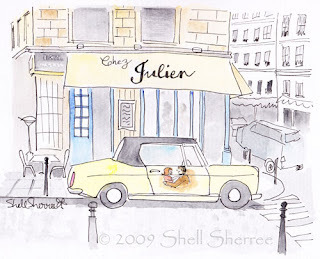 That car must come with the place—I saw a picture of Chez Julien in the NY Times last year & it was there too. WOW! This is even better than the photo! I really LOVE this - it's so romantic and so Paris. Kellie ~ Thank you ~ and thanks for dropping in! Alexa ~ I had a feeling you'd enjoy it. ;) So it's "the" Chez Julien - wow! from cali ~ Nice! I should have asked earlier for the background info but you'd have been asleep when I did the post. I knew you'd all fill in the blanks for me today! I just LOVE this drawing! You capture Paris in such a wonderful way. I will definitely have to stop by Chez Julien when I'm in Paris in October. Wait, you've seen holiday snaps from cali? I'll have to pester her about that. Thanks, Katie! I hope they have Chez Julien postcards especially for you. I have to confess I've never been to "Chez Julien". I will certainly correct that when my next errands in Paris. I love your drawings, same as Alexa, Paris and Venice, never too much !!!! Marylène ~ oh, to be able to say 'when my next errand's in Paris'! How wonderful! I have this photo!!!! I thought catching the car was a lucky break. So it stays there all the time> J'adore!